1 lb. of shrimp, chicken, pork, steak, etc..
Cook rice, quinoa, farro or whichever grain you choose as directed on the package and then set aside to cool. Heat the canola oil on medium high heat in a 8-10 inch non-stick saute pan, saute onion and ginger for 3-4 minutes, and then add garlic and saute for 1-2 more minutes. If using frozen veggies, then precook in microwave for 2-3 minutes until al dente. Add all veggies except green onion to the garlic/onion mixture. Cook for 2-3 more minutes until tender. Push the veggies to the edge of the pan and add sesame oil. Add meat of choice and cook in the sesame oil, if using raw shrimp, chicken, or pork then cook until no longer pink in the middle. If using steak, then cook to preference ie medium, medium well, etc. 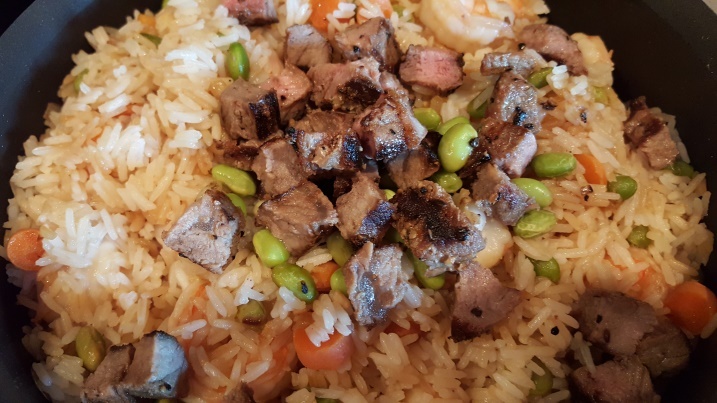 This is also a great recipe to use leftover meat in, in my picture you can see I used shrimp and added leftover steak at the very end. Stir in rice, soy sauce, and egg then mix well, and top with green onion.